In Literacy we acted out the story of 'The Three Little Pigs'. The children loved using the straw, lollipop sticks and cubes as props. We though about the characters and the feelings they may have had. You could discuss the story at home at think about if the Wolf could have been misunderstood. We also thought about different versions and which parts could be changed and which should remain. Today we were lucky enough to have a visitor in school, Matthew from 'West End in Schools'. 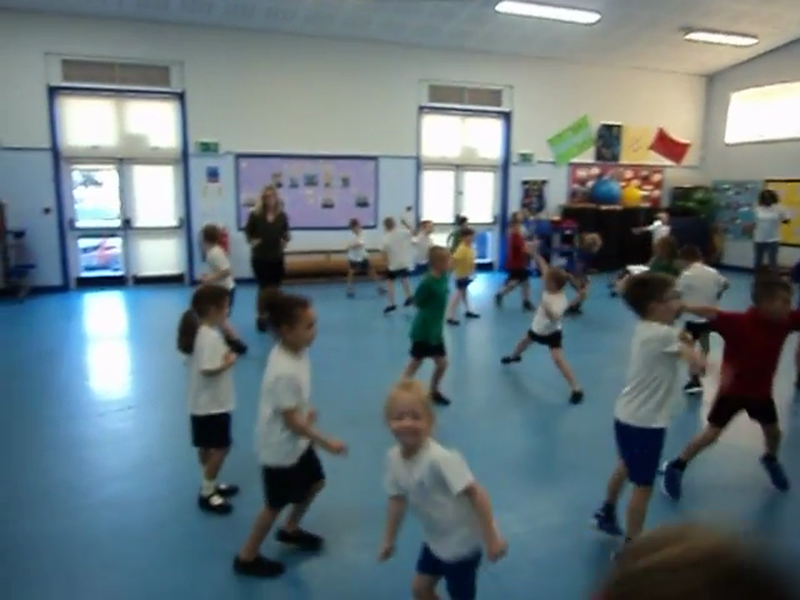 West End in Schools offers children the opportunity to explore Music and Dancing using their own creative imagination. Matthew spent time with each class exploring various types of music from around the world and the dance moves connected to that country. In our imagination we travelled to various places including France, Scotland, New Zealand, and more. Among the dances learnt were the Can-Can, The Haka and Highland Trot. The children had a wonderful time and even had the opportunity to show off their own dance moves during the free style section. For our Harvest Festival we are performing 'Misty' by Shirley Hughes on the stage. We all have two words to say with our partner and a team effort makes the whole performance come together. It has been fun reflecting on the seasons changing and to notice that Autumn is well on the way. In Art we are using colour wash to create sunset and Autumn tree silhouettes. We are also making folding fish to explore length. In Literacy we have shared 'Where's The Baby? ', 'The Very Worst Monster' and 'Silly Billy' by well know author Pat Hutchinson. These stories link with home and family themes. We have been doing lots of talk before writing and also drawing pictures to help us prepare for writing all about one of the characters from the stories and the room settings which is where disaster struck! What a brilliant start to the new school year. All the children settled in really well and we all had a lovely first day! In Numeracy we thought about what numbers were for. We then explored odd and even numbers, discovering that if we would make 2 towers the same, they added up to make an even number. Talk to your child about your house number. Is it odd or even? How do we know?